Everything was cold. We were ready. We altered the jumpers and booted the system, clocking up to a racey 33MHz. At this speed "Doom" became very playable. But we were not satisfied. This was only the beginning! Changing the jumper settings once more, we clocked up to an impressive 50MHz. Impressive by anyone's standards! "Doom" ran more smoothly than we could have dreamed, but our sensitive monitoring equipment began to warn us of a severe heat problem. It was time to really chill this baby! 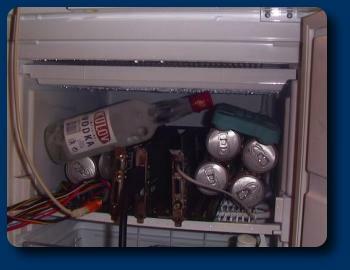 A selection of chilled beverages was placed in the freezer along with the system, reducing the temperature to -53 degrees C! As the warning lights blinked out one by one, we began to increase the speed of the processor, first to 66, then 75MHz. At these speeds, "Duke Nuke'm 3D" was more than playable. (*)Note: The Freezer used is a Lec Power Larder, chosen for its superior freezing ability. Its dial can be raised to a freezing factor of 11, where most freezers can only manage a pathetic 10. A large portion of the success of this experiment can be attributed to this (rather than the skill of the technicians).